The bond between pets and people is powerful. Numerous studies show that pet ownership is associated with better overall physical and psychological health. People with pets have better cardiovascular health, are sick less often, and visit their doctor less frequently than non-owners. Psychologically, pets help their owners with loneliness, depression, and anxiety. They also provide companionship, a sense of purpose, and help their owners handle stress more effectively. CAS hopes to help our most vulnerable community members keep this important relationship in their lives for as long as possible. Meet Sue and Shiro! They are part of the CAS Community care programme. Sue is an animal lover and has cats and a dog. She is currently a cleaner and can barely make ends meet. However, when Sue and Shiro crossed paths, she knew she had to save him. Shiro was abused by his previous owner and treated very badly sadly. Sue had kindly offered to take Shiro in and his owner gave him up to her. Sue has taken such wonderful care of Shiro despite her tough financial situation. We have helped Sue with sterilising, vaccinating, chipping and also doing teeth scaling for Shiro. His bill was $250 and we hope you will help us help Shiro and Sue! It's with a heavy heart that we're sharing Senang's passing. When we left the vet this afternoon it began to rain, almost as if the sky was mourning him. Now that he's over the rainbow bridge, we're certain he will run free. His arthritic legs will carry him better than ever. He will be happy. Rest in peace, Senang, and we are sorry we could not have done more for you much earlier. Update: Coco has been on drip for a couple of weeks. He has responded very well and the vet says he will only need a review given his blood works look good. Thank you for supporting him and Lee Chew so Coco could get better! 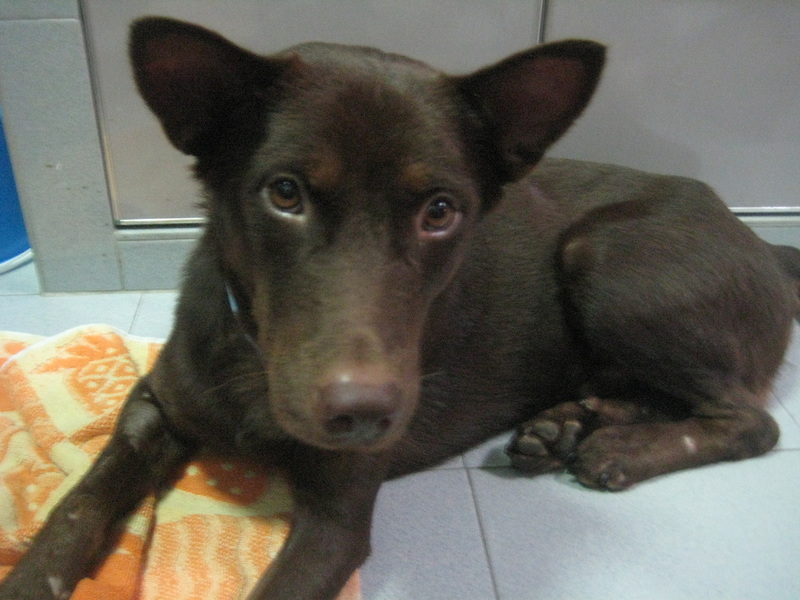 Coco like many street dogs was born to the streets and grew up in a heavy vehicle carpark. Life was never easy from the start and it seems things just got tougher. Coco was the most submissive of his pack on the streets. He was originally trusting of humans due to his feeders efforts in feeding and caring for him on a daily basis. Sadly, this made him a victim of abuse when he was hit with sticks by the drivers who found street dogs in the area an unpleasant sight. The last straw came when Coco was found lying immobilized, possibly run over by a heavy vehicle. After months of treatment, Coco was back on his feet and walking again. His feeder now cares for him. However, recently Coco was struck with kidney failure. To many, Coco is simply a street dog but to Lee Chew, his feeder, Coco is one of her own and he is everything to her. Lee Chew is unable to cover the hefty medical bills and treatment Coco requires as her job as a dishwasher pays very little. Will you be able to help her help Coco get better? Update: Thank you for your kind support for Tannie's medical bills! She has since undergone an amputation and sterilisation She is copping well with three legs, but her handicapped state prohibits her returning to the construction site. Tannie is now recuperating with her foster mummy and potential adopter, Carole. Tannie is a community cat that is cared for by Mr Tan and his team of foreign workers. Tannie is fed, cuddled and very much loved by the team. Sadly, Tannie had wondered out of her work site recently and came back with her front paw ripped off. 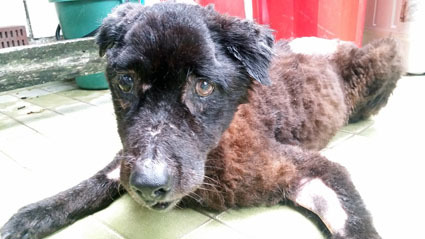 Mr Tan and his team were frantic and eventually got in touch with CAS to see if we could help poor Tannie get better. Tannie will need an amputation in order to prevent an awful infection or maggot wound. Mr Tan and his workers love Tannie dearly and we hope to help them help a community cat get better. They were so worried and even wanted to help offer what little they earn to cover a part of her surgery. The guys also offered us dinner at their make shift dining table at the work site when Tannie returns! We couldn't turn them down and neither could we leave Tannie to fend for herself.